Rudolph’s Revenge is a 5 reel, 50 line Video Slot game that has fixed betting limits of $2.00 or $0.04 per line and is a sequel to the hit video slot game Santa Strikes Back. Rudolph’s Revenge also offers players a chance to win a progressive jackpot. This is a fast and easy to play game that appeals to many slot players but especially the casual player thanks to the $2.00 fixed betting limit. This game uses Realtime Gaming Software which means this game will run as smooth and flawlessly as is possible. This game looks so good that if you ever saw it, you would even say it glows. The game also features a manual Stop button which lets the player stop the reels from spinning at any time during the spin. 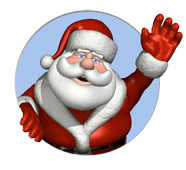 This is a funny, fun and great Christmas Themed game of slots and you can play it for free at Classy Coin Casino. Once you get there you will want to download the casino as the downloaded version runs much better than the browser based casino. Once Classy Coin Casino has downloaded you will then open it and register an account with them. You will instantly be given a free $2500 no deposit bonus just for registering so be sure to take advantage of the free money they are willing to give you. Once you are registered you are ready to play Rudolph’s Revenge. To find it your first step is to click the “Slots” option located at the top of the games list. From there you will see a 3 Reel, 5 Reel and Bonus choices listed. Rudolph’s Revenge is a 5 reel game so click that and the games are listed alphabetically so scroll down until you find the Rudolph’s Revenge game and you are ready to play and enjoy. This is the sequel to the hugely popular Santa Strikes Back Video Slot Game and this version is just as entertaining as its predecessor. Although the betting limits may not appeal to the High Rollers I think everyone can appreciate this game. There is a fixed betting limit of $2.00 per spin or just $0.04 per line. Rudolph’s Revenge has a great progressive jackpot that can be won by landing 5 Rudolph symbols on a pay line during a normal spin of the reels. If you are able to land 5 scattered bomb symbols you can win up to 20X your total bet so good money to be won with this. But if you are only able to land 3 or 4 scattered bomb symbols you are still in for some fun and a chance at some great money. 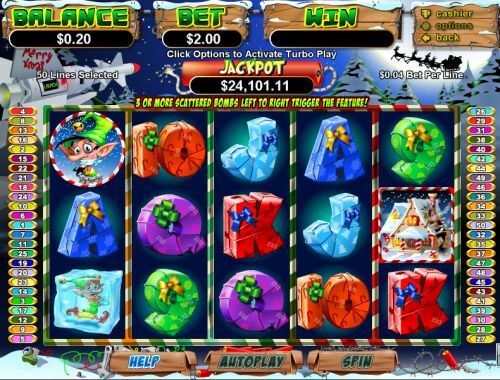 3 or 4 scattered bombs will win you 7 free spins with all of the winning coming off of the 7 free spins being multiplied by the number of Rudolph symbols on the reels. Although you can’t win the progressive jackpot during the Bonus Games you still have the chance to win up to 5000 coins. Rudolph’s revenge has an Auto play feature where you can set the number of spins you would like to play consecutively allowing you to sit back and watch as your winnings continue to climb. You can set the Auto play to stop based on number of spins, if a jackpot has been won or you can pre-set the amount you want to win or are willing to lose. If either of those numbers are reached then it will stop automatically which is a neat feature to include. Also players can stop the Auto play at any time by simply hitting the Stop Auto button.